Somewhere, stashed away in a locker, a basement, or the trunk of a car, lay seven downcast garden gnomes, spirited away from their happy homes in 13900 block of North Shady Lane in Mequon. 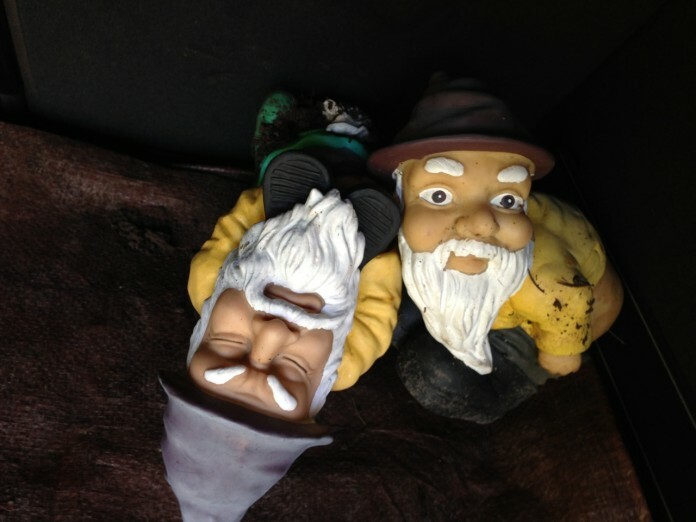 The gnomes, taken over a period of three weeks, were reported missing to Mequon police on September 17th. Since then, no word has come that a single one has returned. We can only speculate on what kind of black market exists for anthropomorphic lawn & garden ornaments – and what kind of conditions these kidnapped trolls are forced to endure. All we know is that in one corner of Mequon, gardens seem empty, children are lonely, and gnomes, jockeys and flamingoes live in fear. If you have any knowledge of the whereabouts of these missing miniatures, please contact the Mequon Police Department or Ozaukee County Gnome Rescue.